Bordeaux uses the term ‘petite chateaux’ to describe the many modest small wineries making good wine at reasonable prices. There’s not really a term for similar in the Cape and Ken Forrester has taken Petit Pinotage as the brand for one of his wines. So I don’t know a collective noun to describe them but I’ve been impressed recently with wines from labels I’ve not encountered before. First up is Arniston Bay — well, of course I’ve previously come across this heavily promoted brand and posted about their Pinotage Rose in its innovative pouch in October 2007, and I had a bottle or two of Savvy in Cape restaurants— but I haven’t drunk a bottle of their red Pinotage. I was very pleasantly impressed with Arniston Bay ‘Bushvine Selection’ 2009 (WO Western Cape) which “comes from 20 year old bush vines” aged 16 months in French Oak barrels. The appellation is Western Cape, thus the grapes are sourced from various places so it unlikely that all the vines were exactly 20 years old, but that’s the sort of thing only a pedant like me would question. Good fruit and oak integration, a very posh wine that was a real pleasure to drink. Aan de Doorns in Worcester was new to me. Its back label, on a pleasingly heavy bottle, says it was produced from ‘specially selected vineyards’, which I guess is true of every single wine everywhere. According to cellar master Johan Morkel in Platter, the cellars “most importent focus” is supplying leading UK brand FirstCape. I wish them the best, but I think they could blow their own trumpet a little louder because this Aan de Doorns 2010 Pinotage (WO Worcester) was a real cracker that made me stop mid-meal and stare at my wine glass. Good depth of fruit, nicely rounded, complexity and superb drinkability. It was one of those wines that is finished before the meal and has you checking the punt to see if the wines has been leaking away. Lutzville Vineyards is up the coast several hundred kilometres from Cape Town in the Oliphants River region, a place I have never been, yet intend visiting in the next couple of weeks. Lutzville ‘Cape Diamond’ 2010 Pinotage (WO Lutzville Valley) was jucily fruity, with ripe mulberry and red plum flavours and was an enjoyable lip-smacking wine. No information on the label about age of vines or wood aging. Three cracking good wines, all beautifully made and all offering real drinking pleasure, and all new to me. Even after so many Pinotages, I’m still learning. Joe Roberts at 1 Wine Dude puts out a call to 'Stop hating on pinotage already'. His 'plea against the undeserved hate' asks readers 'what bargain-basement version of any variety doesn’t have its fair share of sh*tty-tasting bottlings?'. Is it my imagination that when Pinotage detractors find one they like it is always because it is atypical? In my book it's the badly made ones which are atypical. 'Fruity, bright and lively with nice cherry and berry notes, showing admirable purity. No heaviness, and really drinkable. 86/100'. Meanwhile I lunched with friends at Neetlingshof Estate yesterday. Cellar Master DeWet Viljoen was also there there having a business lunch with potential foreign clients but he found time to put a glass of pale red wine on our table. It was light bodied and tasted like a fine old claret, yet had lively sweet fruit. What could it be? DeWet then revealed the bottle - a 1984 Neethlingshof Pinotage. My, how this variety can age. Atypical? I don't think so. 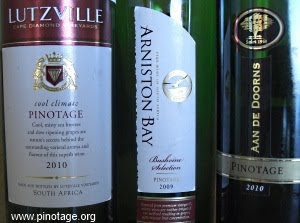 A spiffy new Guide to South African Pinotage was published on Friday by the producer’s Pinotage Association. The event took place in Wellington at Diemersfontein Winery, the home of the original coffee’n’chocolate style Pinotage. The main part of the 156 page full colour pocket sized Guide is a listing of wineries producing Pinotage and Pinotage blends with descriptions of their wines and wine land maps to guide visitors. The book also covers Pinotage history and food and wine matching with several Pinotage recipes including Pinotage ice cream and Beyerskloof’s signature Pinotage burger. The subtitle 1995-2011 refers to the year the Association was formed till the most recent Top 10 Competition. The book lists the most successful wineries in the 15 years of the competition, which commenced in 1997. 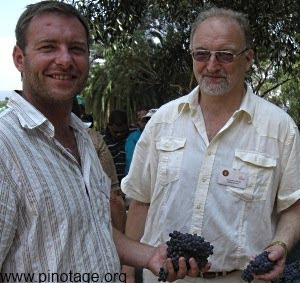 Association Chairman Beyers Truter said that better Pinotage was being made now than ever before, with sales of bottled Pinotage increasing 11% year on year in South Africa and annual exports from 5.5million to 9.5 million bottles in the five years to 2008. Beyers Truter also announced a further five years of sponsorship by ABSA Bank worth ‘a few millions’, although he declined to name the exact figure. We finished outside together with the farm workers standing around bins of freshly gathered Pinotage grapes for the ceremony of blessing the harvest. Sultry, Heady & Tantalizingly Delicious! At the 6th Terravino Mediterranean International Wine and Spirit Challenge held in Israel last month, the Grand Champion Trophy for the Best Israeli Wine in Competition was won by Barkan Winery’s Superieur Pinotage 2007. That wine also won the Best Kosher Israeli Wine, and Barkan’s winemaker Irit Boxer-Shank won the Best Israeli Winemaker award. Barkan have been making Pinotage since 2001, and were the first to do so ,but this is only the second vintage accorded Barkan’s Superieur designation, reserved for wines of "exceptional quality wines which represent the best that the winery knows how to make".